This week there is one thing that I am extremely grateful for – the flexibility that I have because of working from home. Now, I’m not talking about the stereotype of the WFHer that sleeps in late and runs errands on work on time. I am talking about the flexibility to take my office with me wherever I go. As some of you may know, we lost my father-in-law last month. He was a snowbird, so he had houses in both Ohio and Florida. My husband inherited the Florida house, so we decided to take a week-end trip down and start getting it cleaned out. Unfortunately, the first thing we found when we walked into the house is that the skylight in the kitchen had sprung a leak. We aren’t talking about a little water spot on the ceiling kind of leak. We are talking about a full-fledged put-a-bucket-under-it kind of leak. So, we changed my flight and called the roofer. Since I had my laptop and all of my work gear with me I was able to just set up a home office in the Florida house and not have to take any time off to deal with house issues. I can put in a full day of work, and still be physically present for the repair people. It has been a lifesaver for me to be able to stay here and deal with everything, and it has been completely seamless to my employer. If I had a regular job these unexpected two weeks in Florida would have killed my vacation time for the year, thrown me way behind on all of my projects, and caused a huge burden to the co-workers who would have had to cover for me. Another thing that I’m really grateful for? 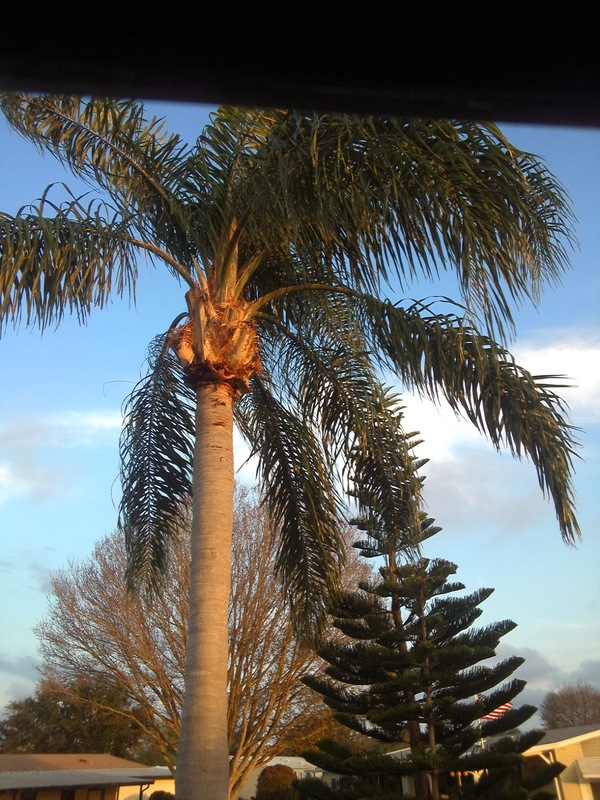 The gorgeous view outside my Florida office window. It is a rough life, but somebody has to live it. Sports history was made this week-end, and it had nothing to do with the Olympics. This week-end marked the first time that a woman has played a contact position in a professional men’s football league. An awful lot of people think that this was some type of marketing stunt, but I personally know the woman in question and I can guarantee you that this is no stunt. This trailblazing football player is Dr. Jen Welter and she is going to be the first person I write about in my “Women That Inspire” series. In Dr. Welter’s interviews it quickly becomes obvious that she is not doing this for herself. She is very vocal that this is about giving young girls an example and opening doors for girls to play sports that are not “girl sports”. She always wants to teach girls the lesson that you earn respect by taking the big hit, getting back up, and going for it again. I don’t have a daughter, but if I did I would be eternally grateful to Jen for teaching this lesson that goes far beyond the playing field. Although Dr. Welter is mainly trying to be a role model for young girls, she is also a wonderful role model for us “big girls”. She shows us by example that you have to push for what you are passionate about. She reminds us that it doesn't matter what other people think we “should” be doing with our lives. The thing that matters is that we pursue our dreams, that we go out onto our chosen playing field & play with passion, that we take our hits & keep on playing. I have never really been that into Valentine’s Day. It has always seemed to be a bit of a made up holiday and if I’m going to get lovey-dovey cards and presents from someone I want it to be because they are feeling it, not because Hallmark told them they had to. So, hubby has always gotten off easy. The hubby and I met while we were both in the army. Shortly after we were married we were transferred to Fort Drum. If you aren't familiar with it, Fort Drum is the home of the 10th Mountain Division and is located about 30 miles from the Canadian border. I am a native Texas, so it is no stretch to say that I was woefully unprepared for months on end of snow and sub-freezing temperatures. It seemed like the sun never shined. It was always gray outside and my mood matched the weather. 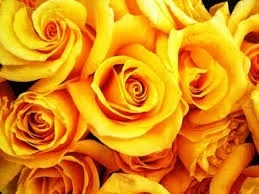 One incredibly cold Monday afternoon in January my hubby came home with a dozen yellow roses in his arms. It wasn't my birthday, it wasn't our anniversary, it wasn't any special occasion whatsoever. He had stopped by the florist because he wanted to bring me some flowers, and he said that when he saw the yellow roses he thought that they would bring me some sunshine and that they would remind me of Texas. That day was over 15 years ago, but I still get a little misty eyed when I think about it. He has brought home flowers many times since then (he is a big fan of “just because” flowers), but I still think that bringing me home sunshine in the midst of the worst winter I had ever known was the most incredibly sweet & romantic gesture of all time. Happy Valentine's Day! Please feel free to share your romance stories in the comments. I'd love to hear about them! Today is the second part of my “What I Love About Working From Home” series, and it is all about food. Managing to have a healthy breakfast and lunch was darn near impossible when I worked in an office. I always intended to get up early enough to have a light, sensible breakfast and pack my lunch, but I was much too fond of the snooze alarm to make that happen. So, I wound up skipping breakfast and grabbing fast food for lunch. Bad, bad, bad. Now that I am working from home I have so many more options when it comes to my food choices. I’m not limited by what can be reheated in the microwave or whether there is room in the breakroom fridge. I’ve never been much of a breakfast eater, so most days it is just a hard boiled egg and a piece of fruit or maybe a toaster waffle. Sometimes I just wait and make myself an omelet and have brunch. That is definitely something I couldn’t have done in my cubicle! For lunch I try to have leftovers whenever possible. On days that I don’t have leftovers I usually just heat up some soup or have a sandwich. Yeah, I know that is all stuff I could have done in an office, but I was always so bad about forgetting to pack them along. Another great thing (especially in the winter) is that I can put on a pot of stew or chili or pop a roast in the oven during the day. My house stays toasty warm and dinner pretty much cooks itself while I’m working. I get to feel like both super employee and super wife. Can’t lose situation! 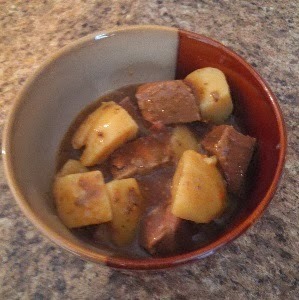 My favorite stew. Nothing but meat and potatoes. So, yesterday I learned the quickest way to make friends with your neighbors in the wintertime. It is really quite easy. 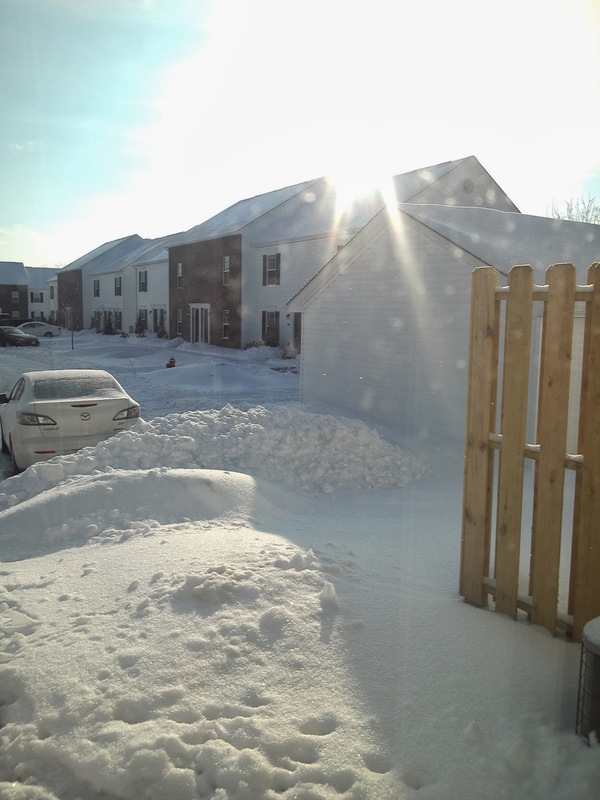 All you need is a snow shovel on your back patio and a townhouse complex that didn’t plow the parking lot. Almost immediately you will have neighbors beating a path to your door to borrow said shovel. Overall, the commercials during this year’s Super Bowl were really not that exciting. Of course, there are always a few that get people talking and set social media buzzing. One of the most talked about is the Coke ad that featured “America the Beautiful” sung in multiple languages. While I was first watching it I thought that the song was incredibly beautiful in some of those languages. I was also reminded of the old “I’d Like To Buy The World A Coke” commercial and its message of harmony. I was completely shocked when this commercial turned out to be controversial. I am flabbergasted by those that assumed that every non-English singing person in the ad represented a first generation immigrant who refused to learn English. What? My assumption was that they were bilingual. You know, it is quite possible for someone’s family to have been in this country for many generations and yet they still know another language. Heck, I know Spanish and to the best of my knowledge there is not a drop of Hispanic blood in me. Get over it people! Another commercial that caused quite a bit of buzz, but in an entirely different way, was the Budweiser puppy commercial. I always look forward to the Budweiser Super Bowl ad, and this year they really hit a home run (oops, wrong sport). I am a dog lover, so it made me all kinds of squishy inside. Heck, even non-dog lovers found this one adorable. I detested the Bud Light ads, but Budweiser comes thru as usual. One of my personal favorites was the GoldieBlox ad where the little girls take all of their pink girly toys, put them on a rocket, and blast them into space. I love that there is a company that doesn’t assume all little girls are alike in their love of pink and/or fluffy toys. When I was a little girl, I was quite stereotypical in my choice of toys, but there wasn’t a whole lot of choice way back then. Congrats to GoldieBlox and thank you for giving today’s girls greater options in their play. So, what about you? Were there any Super Bowl ads that really struck a chord with you?